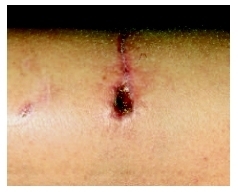 The bacterial species most commonly found in animal bite wounds include Pasteurella multocida, Staphylococcus aureus, Pseudomonas sp. , and Streptococcus sp., P. multocida , the root cause of pasteurellosis, is especially prominent in cat bite infections. Other infectious diseases from animal bites include cat-scratch disease, tetanus , and rabies . Cat-scratch disease is caused by Bartonella henselae , a bacterium that is carried in cat saliva; infection may be transmitted by a bite or scratch. Approximately 22,000 cases are reported each year in the United States; worldwide, nine out of every 100,000 individuals become infected. More than 80 percent of reported cases occur in persons under the age of 21. The disease is not normally severe in individuals with healthy immune systems. Symptoms may become serious, however, in immunocompromised individuals, such as those with acquired immune deficiency syndrome ( AIDS ) or those undergoing chemotherapy . Common symptoms include an inflamed sore in the area of the bite or scratch, swollen lymph nodes, fever , fatigue, and rash. View of an infected animal bite. (Azactam) has been reported to be effective in treating infections caused by P. multocida . In most cases, antibiotics taken by mouth are sufficient; however, some deep bites may require treatment with intravenous antibiotics. Pasteurellosis —A bacterial wound infection caused by Pasteurella multocida . Pasteurellosis is characterized by inflammation around the wound site and may be accompanied by bacteria in the bloodstream and infection in tissues and organs. See also Cat-scratch disease ; Human bite infections ; Rabies . "Central Nervous System Viral Diseases: Rabies (Hydrophobia)." Section 13, Chapter 162 in The Merck Manual of Diagnosis and Therapy , edited by Mark H. Beers and Robert Berkow. Whitehouse Station, NJ: Merck Research Laboratories, 2002. Dodman, Nicholas H. If Only They Could Speak: Stories about Pets and Their People . New York: Norton, 2002. Contains several useful appendices about aggression in various dog breeds and a sample assessment form for evaluating a dog's potential for biting. "Cat and Dog Bites." American Academy of Family Physicians (AAFP) , September 2002. Available online at http://www.familydoctor.org/x1827.xml (accessed November 9, 2004). Fisher, Donna J. "Rabies." eMedicine , January 29, 2004. Available online at http://www.emedicine.com/ped/topic1974.htm (accessed November 9, 2004). Friedman, Allan D. "Catscratch Disease." eMedicine , July 17, 2003. Available online at http://www.emedicine.com/ped/topic333.htm (accessed November 9, 2004). Stump, Jack. "Bites, Animal." eMedicine , August 23, 2004. Available online at http://www.emedicine.com/emerg/topic60.htm (accessed November 9, 2004).